9-12:00 AM and Sunday afternoon, August 6 from 1-3 pm. 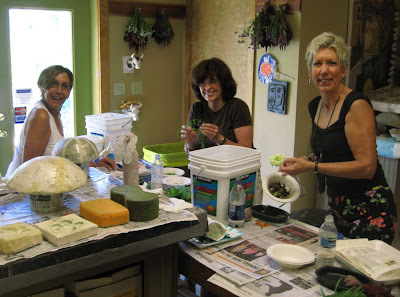 Participants wander the garden selecting colorful leaves and blossoms and fragrant herbs to use in making their paper. 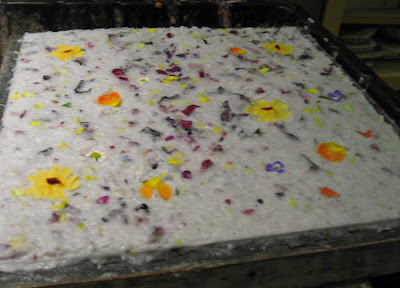 You will learn to make beautiful custom sheets of handmade paper. 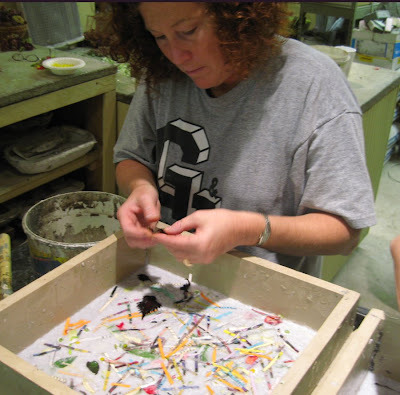 Then you will learn to sculpt a simple shape and make a simple plaster mold for paper casting. This group liked making paper so much they opted to forego other projects in order to keep on with their experimentation. The possibilities are endless when the garden is at this stage of high summer growth. 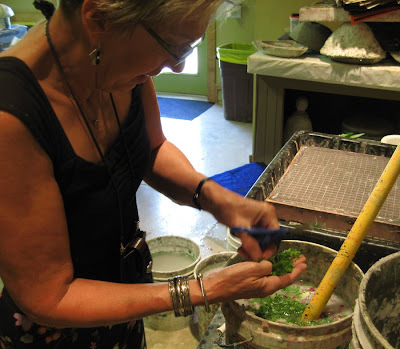 This sheet is made with marigolds and lemon balm leaves. Here's a handsome blend of purples and greens. 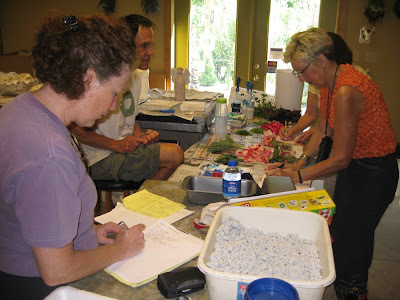 Carolyn snips the small leaves of fino verde basil for her paper. Besides adding great color, it smells heavenly! 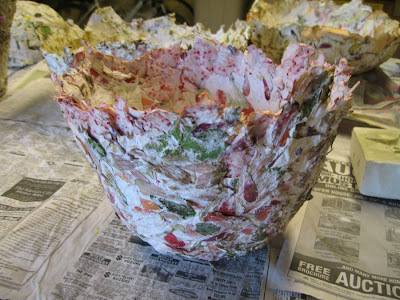 Brenda mixed in confetti made from shredded seed catalogs to kick up the color a few notches. 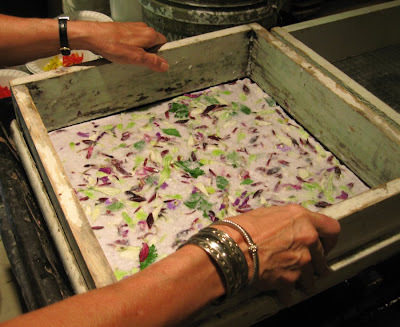 Anne carefully positioned small thunbergia blossoms into her paper after it was poured. 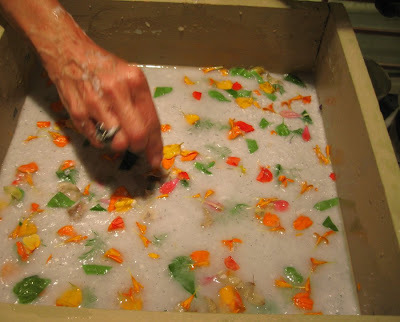 Carolyn trims the edge of her paper bowl featuring multi-colored zinnia petals. 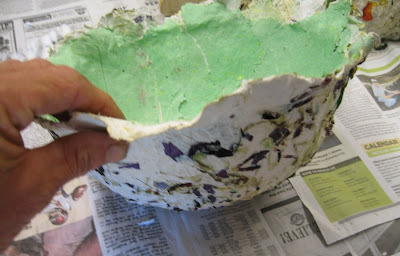 Damp handmade paper is applied to the bowl mold and patted into shape. 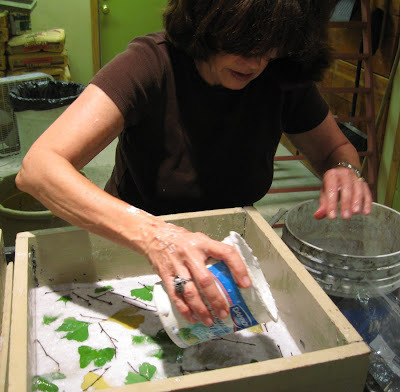 Susan created a custom sheet using birch twigs and ginko leaves. 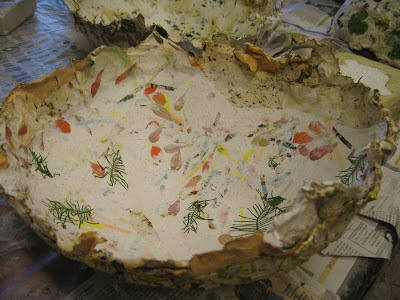 On the second day of the GARDEN PAPER WORKSHOP the paper bowls were ready to be removed from their molds. It is always exciting to see what surprises you'll find on the inside. These bowls are beauties! This bowl was made with pape containing red, coral and orange zinnia petals. ...and this one with celery leaves and white zinnia petals. This one reminds me of a cabbage! 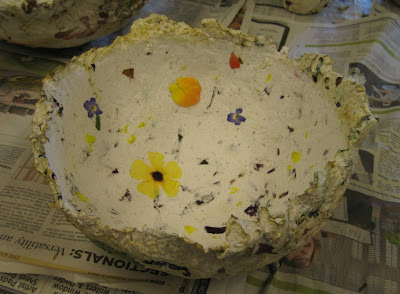 ...and Anne's thunbergia blossom bowl. 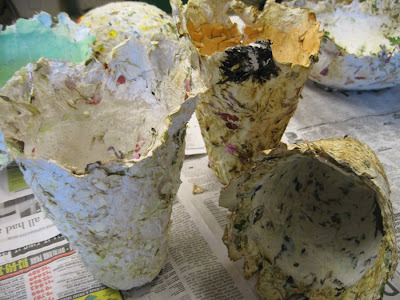 Three vases made from different papers. 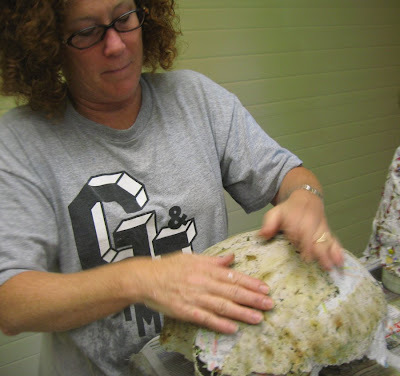 This is the plaster mold cast from Brenda's sculpture of a bee. 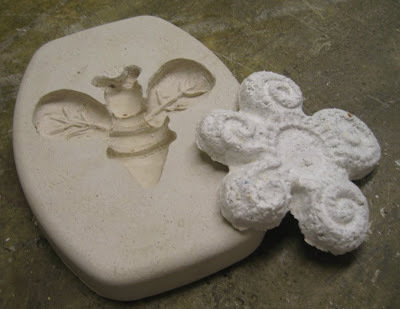 She will use this mold to cast paper pulp shapes similar to the flower on the right. 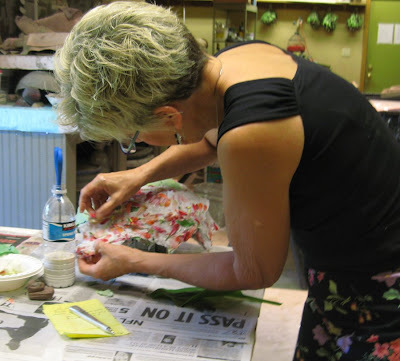 They can be used to make ornaments or even a decorative garland. Taking a little time to jot down some notes. it would be hard to remember everything we've done in the Garden Paper Studio! 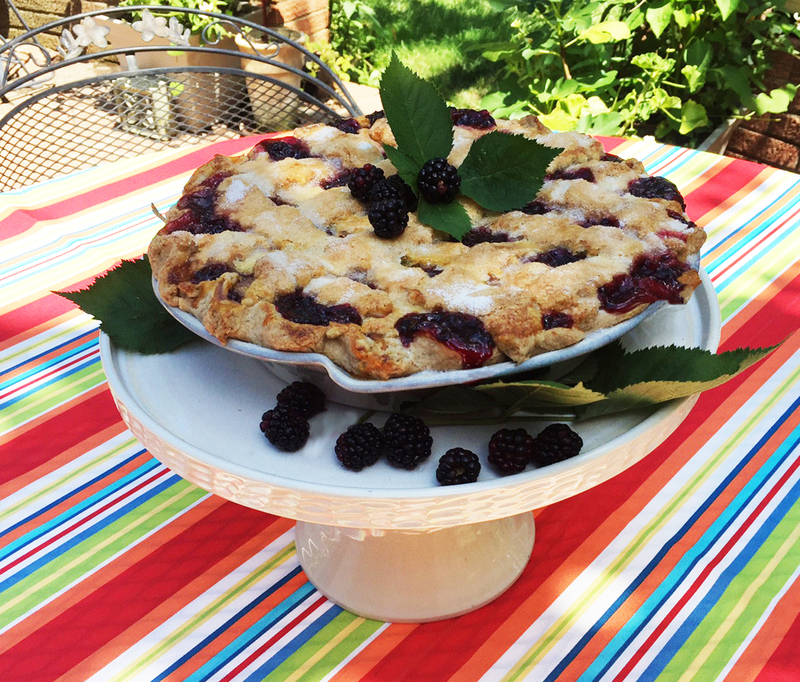 It's blackberry picking time and eating the sweet berries fresh is a special treat... but since pie is at the top of my food chain, I can't pass up making this awesome Blackberry Lemon Pie. This is a deep dish pie and has a few more steps than a conventional "throw it all together and dump into the pie plate" routine. I was watching Alton Brown from the food channel discuss the benefits of cooking a fruit filling before filling the pie. This results in a perfectly shaped pie that does not collapse and has no bubble over making a mess in the oven. In this recipe, I tried a little of each, some of the filling precooked and a fresh berry mixture added to it after cooking to retain the shape and texture of whole berries in the pie. This pie's a keeper and it's hard to keep from "just trimmming the edge"! In a food processor, combine flour, salt and sugar. Add butter and shortening to the flour mixture. Pulse to combine all of the ingredients until the mixture looks like coarse sand. Add the cold water, tablespoon-by-tablespoon, pulsing in between tablespoons. Seriously, pulse. You don’t want the heat from the motor interfering with the consistency of the dough. Add water until the dough comes together into a ball. The dough should not be sticky or crumbly. Divide dough in half and shape into 2 disks. Wrap each disk in plastic wrap and keep in the fridge for at least 30 minutes. Mix the 2 cups reserved berries with ¼ cup sugar and 1 tablespoon of tapioca. Set aside. In a medium saucepan over medium heat, combine berries, 1 cup sugar, lemon juice and zest. Cover and slowly bring to a simmer for 15 minutes, (not a hard boil) Dissolve 1/4 cup sugar in ¼ cup water and stir in cornstarch. Add some of the hot berry mixture to warm the paste and then thoroughly mix into the simmering berries. Stir constantly as mixture thickens. Remove from heat and add vanilla. Set aside and let cool. *Note: Depending on the sweetness of the berries, you may need to adjust the sugar. Berries picked at the peak of season tend to be sweeter than the more tart ones supplied year round. On a lightly floured surface, roll out 1 disk of dough until 10 inches in diameter. Gently place the dough into the pie plate and crimp edges. Place in fridge for 30 minutes. 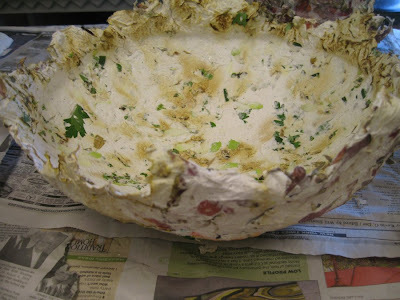 After 30 minutes, place the cooled filling into the prepared pie plate. Roll out the other disk of dough and cut into ½- inch to 1- inch strips. Place strips horizontally onto the pie. Start placing strips one-by-one vertically, lifting every other strip to create a lattice pattern. Brush 1 slightly beaten egg gently onto exposed piecrust. Sprinkle coated crust with sugar. Place the pie onto a cookie sheet and place in oven for 25 minutes. Rotate and let bake for another 30 minutes or until the crust is golden brown.